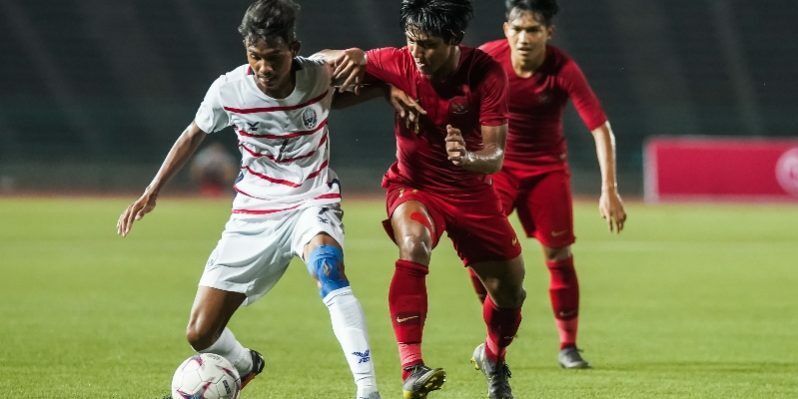 PHNOM PENH (22 Feb 2019) – A brace from Marinus Wanewar put Indonesia in the semifinals of the AFF Under-22 LG Cup 2019 when they beat hosts Cambodia 2-0 in the final game of Group B that was played tonight at the National Olympic Stadium. With the Malaysians also on the winning trail when they beat Myanmar 1-0 across town at the RSN Stadium, the victory failed to elevate them for a place in the next round. Malaysia only picked up four points as against Indonesia’s five where they will now join Cambodia in the semifinals of the championship in two days. Indonesia started strongly against a Cambodian side not only assured of a place in the final four but who had also won the group following their two victories over Malaysia and also Myanmar previously. And Indonesia do not seem to be playing under pressure as they took full control of the flanks and where in the 20th minute a cross from the right off Witan Sulaeman gave the chance for Marinus to score from close. With five changes to the side that overwhelmed Myanmar in their last game, Cambodia’s attempt lacked their usual drive and tenacity as the score remained all the way for much of the second half. And seven minutes to the end, Marinus sealed the win for Indonesia as he evaded his markers to make good on the cross from Osvaldo Haay. IN THE MEANTIME, Malaysia scored a futile 1-0 win over Myanmar in the match that was played at the RSN Stadium. The Malaysians put up a better show than what they had done in their first two matches of the competition as the two strikers of Muhammad Jafri Chew and Muhammad Hadi Fayyad Abdul Razak made their presence felt. But their lack of fitness was obvious as Myanmar’s Win Naing Tun was easily the better player at the other end. Had it not been for the lack of support, Myanmar could have found the back of the net where instead, it was the Malaysians who finally went ahead in the close encounter with Hadi scoring from close following a boucing cross from the left just before the break. Naing Tun was hardworking with the crosses and also effort from distant but it could not change the scoreline as Malaysia held on for the hard-earned win. Following from today’s results, Vietnam will take on Indonesia in the first semifinal on 24 Feb 2019 while hosts Cambodia will entertain Thailand in the second game of the day.